Abandoned after 1956, Old Ingraham Highway is almost forgotten. Finding roads to suit my Royal Enfield Bullet is always a challenge. I'm looking for scenic byways with unhurried traffic and, ideally, the same routes my Bullet might have traveled when it was designed, not long after World War II. Even using Google maps set to "avoid highways" doesn't always give me the historic route between two locations. And, even then, I wonder: could roads possibly have been this smooth and well marked back in the day? I doubt it. Surely the first motorists to enter my home state of Florida would have ridden the unpaved telegraph road alongside a railroad track connecting communities. I found myself strolling along one historic route the other day, with only my wife and several alligators for company. Smiling alligator at the edge of Old Ingraham Highway in Everglades National Park. The road has a great name, too: Old Ingraham Highway. It's named for railway executive James Ingraham, who blazed the trail in 1892, looking for a way to get a railroad across the Everglades. Ultimately, Henry Flagler took the Florida East Coast Railroad down the Florida Keys instead, reaching Key West in 1912. Ingraham's route wasn't forgotten, although no railroad was built. Instead, between 1915 and 1919 a road was built from Miami to Flamingo, in hopes of opening up a rich farming region. There were unintended benefits — and problems. Ingraham's road came close to a wonderful place with a wonderful name: Paradise Key. Here, Everglades wildlife and rare vegetation came together in a way that first conveyed to white men and women that there was magnificence in what had been considered just a swamp. Unfortunately, the road made it far too easy for thieves to steal the plants! Ingraham, to his credit, played a role in the creation of a state park to protect Paradise Key. Today, Paradise Key is the Royal Palm stop within Everglades National Park. Tourists travel the the old route of Ingraham Highway to reach the park. Dotted line marks Old Ingraham Highway, replaced by new road, in red. Oddly, once inside the park, a new route replaces most of the Ingraham Highway. The old road was only a foot above the surrounding land so it flooded in the rainy season and yet acted as a barrier to water flow in the dry season. The canal dug alongside it (to provide fill) helped drain the Everglades for farms but it also allowed salt water from Florida Bay to flow inland, spoiling crops. In an effort to restore natural flows, part of the road was torn up and part of the canal filled in. Construction of the new road through Everglades National Park began in 1956. This left the remaining stretch of Ingraham Highway locked forever in 1955. Is it just a whimsical idea, to imagine Model T's and Maxwells and old Indian motorcycles riding this rough surface? Yes. But some evidence remains. In 2003, walking Old Ingraham for the first time with my wife and daughter Erin I spotted something round on the ground. 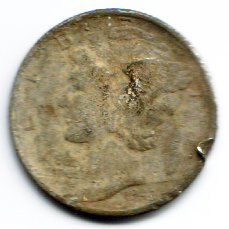 It was a battered and muddy silver dime. These "Mercury" dimes disappeared from circulation in 1965, when the U.S. introduced dimes of non-precious metal. It is unlikely someone dropped this coin after that date. Probably it had been waiting on the road much longer than that. It was dated 1943. Old Ingraham Highway is a hiking and biking trail today. No motor vehicles allowed, including Royal Enfields. But they remember one another, I'm sure. Would love to ride a road like that!